Premium subscribers have already seen our new Syria map format, which shows full areas of control for each major faction in the civil war. Now, we present this month's update free of charge for your convenience. To get many more Syrian Civil War map updates like this one, sign up now for a premium subscription! Premium members click here to view this article in the ad-free members area. 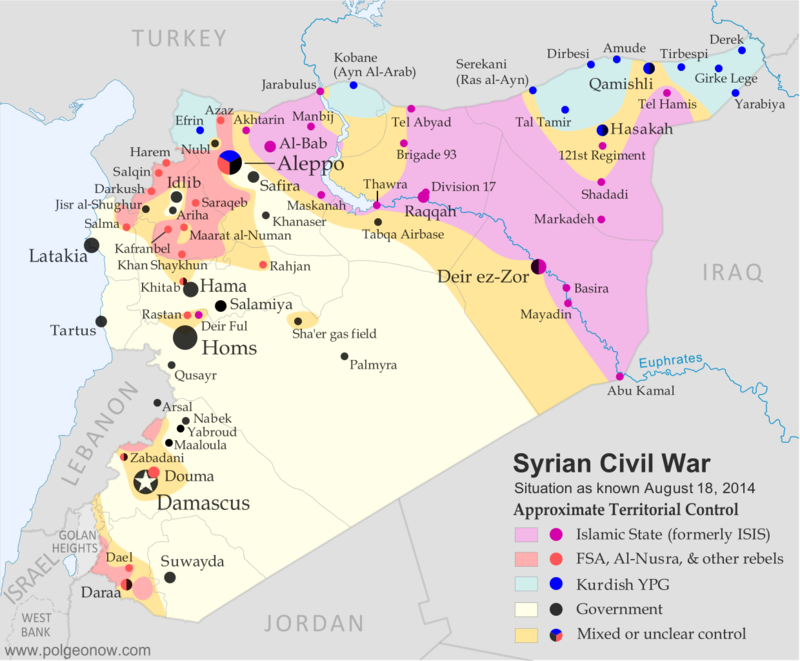 Since our last Syria map update in early July, the lines of control in the civil war have not changed drastically. However, fighting on all fronts has resulted in numerous small but important changes to the situation, as the Assad government is now facing serious challenges from both the newly rebranded Islamic State (formerly ISIS/ISIL) and a loose coalition of various other rebel groups (including both the Free Syrian Army and Al-Nusra). Opposition forces made advances against the army in two parts of Hama province over the past month, beginning in mid-July with their capture of Rahjan in the province's east. Before the end of the month, they had also advanced nearly to the city of Hama, by some accounts fully capturing Khitab and nearby towns. In early August, major fighting erupted in Arsal, a town across the border in Lebanon. Rebels recently driven out of nearby Syrian areas struggled with the Lebanese army over several days before eventually retreating. However, signs of a rift among the rebel coalition may be emerging. Similarly to how ISIS began carving out its own territory late last year, the rebel Al-Nusra Front last month declared its own "emirate" and seized the northwestern towns of Salqin, Harem, and Darkush from formerly allied rebel groups. The powerful Al-Nusra Front is an official affiliate of Al Qaeda, but has up to now cooperated and mixed freely with less extreme anti-government rebels. It remains to be seen whether recent events signal a permanent split. The rebels, including Al-Nusra, have also suffered some defeats. Formerly the major power in Syria's eastern Deir ez-Zor province, they have now been completely driven out, with the Islamic State last month replacing them in Deir ez-Zor city and driving them out of their last territories to the city's northwest (the Islamic State's main campaign for Deir ez-Zor province was covered in last month's update). Within Syria's largest city of Aleppo, rebel fighters also were driven back from some of their positions by an early-July government advance. Above all, the past month has seen a strengthening of the "Islamic State" group, formerly known as the Islamic State of Iraq and al-Sham (ISIS). After seizing much of neighboring Iraq in June, ISIS declared itself to be the Caliphate, a historical term for an empire of all Muslims, and shortened its name to "Islamic State". Controlling the major Iraqi city of Mosul, it has used this newfound power to consolidate its territories in both countries. 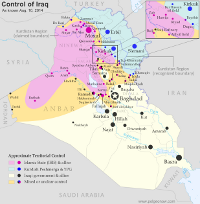 The Islamic State's control in Iraq (click for premium article and map). In Syria, the Islamic State has nearly completed its control of Raqqah province. Though it already held the capital, three key military bases in the province were still controlled by the Assad government. Two of those, known as Division 17 and Brigade 93, were seized by the Islamic State earlier this month, while the last, Tabqa Airbase, is now under siege. In neighboring Hasakah province, Islamic State fighters also captured a key government base, the 121st Artillery Regiment, even waging battles on the outskirts of Hasakah city and advancing nearly to Qamishli on the Turkish border. However, government forces also scored some victories, maintaining joint control of the city with Kurdish forces and at one point pushing the militants back towards their stronghold in Shadadi. The Islamic State has also begun striking out west from its current territories in both the north and the south. In Aleppo province it has been very slowly taking back ground it lost to the rebel coalition in January, seizing the town of Akhtarin just last week. Meanwhile, it has also been pushing against the Kurdish enclave of Kobane (Ayn al-Arab) from both sides. More prominently, Islamic State forces last month boldly stormed the Sha'er gas field near Palmya, far from their established frontiers, though the government soon recaptured it. But pockets of Islamic State control have been appearing even farther afield, possibly in connection with the group's efforts to bring small rebel brigades over to its side. Some reports say the town of Deir Ful near Homs city is now in Islamic State hands, and the group briefly captured a neighborhood outside Damascus last month. Don't miss future updates to the Syria and Iraq control maps! Become a member now! Categories: asia, conflict zones, divided countries, free conflict maps, isis, lebanon, middle east, original maps, rebel control, syria, the "islamic state"